Fixing a story requires a proper understanding of narrative structure. Character development, and its inherent impact on plot, develops naturally over the course of a story. When that organic journey is somehow interrupted by an illogical or emotionally inaccurate progression, a false moment occurs and the story breaks down. These are the moments that audiences simply can’t justify away, no matter how hard they try. Once an event conflicts with the internal structure of the story’s overall purpose, the mind on the receiving end of a story shuts down, instinctively recognizing the disparity in the message. Emotional growth is a complex mechanism, one misplaced piece and the entire message of the story becomes lost in the rubble of good intentions. 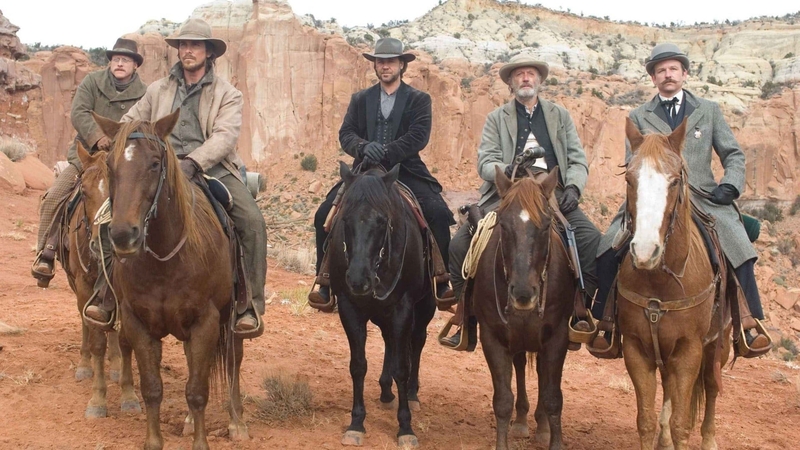 3:10 to Yuma (2007) is one of these films. As wonderful as the cinematography, the direction, and the performances are, this film suffers from a false moment that tarnishes all the work that went into it. It is a moment of falsehood that happens deep within the third act, standing out as brightly as any celestial supernova in the emptiness of space. As a fan of the film, one hopes that on subsequent viewings, this leap of character will somehow have been magically transformed into something more closely approaching truth. 3:10 to Yuma tells the story of Dan Evans (Christian Bale) and his efforts to save his family farm by escorting notorious bad man Ben Wade (Russell Crowe) to a train station in Contention, Arizona. There is a reward for getting Wade there before the 3:10 prison train arrives and Dan intends on securing it for himself and for those he loves. Dan, a Civil War veteran hampered by the loss of his left leg, finds himself in a hopeless situation. With only a drought-ridden ranch to his name and massive debt to a local wealthy rancher, Dan becomes overwrought with his inability to see to the future well-being of his family. But even more drastic is the disdain he feels from his oldest son, William (Logan Lerman). A teenager with all the answers, William makes no effort hiding the shame he feels for his father’s apparent cowardice, going so far as to tell his Dad that “I’m never walking in your shoes.” This tenuous relationship between father and son represents the heart of the story, its eventual catharsis the shared hope of every audience member. Both William and Wade share the same drive to rush into things, to take action, and in that respect, they serve the same dramatic impact on Dan’s growth of character. Wade even makes the suggestion that William reminds him of himself as a young boy. Dan strenuously disagrees, and it is in this clash of perspectives that the cracks in Dan’s character begin to appear; both William and Wade are of the same opinion of what it means to be a man and Dan sadly doesn’t fit the bill. One by one their posse whittles down until only Dan and William are left to cater Wade half-a-mile through the bounty-hunter infested streets of Contention. As the clock approaches three, Wade offers Dan more money than the railroad ever promised him. Dan politely declines. How could he face his son knowing that he compromised with a known villain? And it is here where the story falls apart. And for some God-forsaken reason, Wade changes his mind. Of course, this moment had to happen. Logically it doesn’t make sense that Wade would run alongside Dan all the way to the train station. There has to be some reason why Wade wouldn’t just delay Dan long enough for his deadly gang of bandoliers to save him. But there is a difference between the right reason for doing something and just any old reason. There should be some connection between all that happened in the proceeding two hours and those last final moments. The problems between Dan and Wade stem from Dan’s steadfast conscience. While others are quick to take the easy way out, Dan somehow stays in the game. This intrigues Wade and gives motivation for their friendship to develop. Thematically it is also this sense of conscience that ignites the flames of conflict between Dan and his son. With their barn on fire, William wants to rush in regardless of personal safety; Dan stalls him, forgoing the rescue of their personal effects for fear of even deadlier consequences. With conscience the major source of problems within Dan’s relationships, the solution rightly becomes temptation. You can’t overcome conscience with even more conscience—that doesn’t even make sense. You don’t heal a wound by making it deeper. Yet somehow this is what they wrote into the story of 3:10 to Yuma. Wade’s decision to loosen the pressure on Dan’s neck comes with an appeal from Dan to Wade’s sense of conscience. Telling the story of how he really lost his leg only maintains the presence of the problem between them. With their relationship continuing on the way it always has, why should Wade change? Why does he start treating him like a friend? Wade’s change comes because it is necessary for the plot, not because of any meaningful character growth, and this is precisely why that moment feels false. In breaking the structure the Authors had so diligently setup in the proceeding Acts, the story broke down and audiences everywhere were left shouting at the screen (either internally or externally), Why is he doing that?! What if instead, Dan had taken the easy way out and accepted Wade’s payoff? What if he had given in to temptation and employed the solution to the problems between them. Wouldn’t there have been at least some reason for Wade to change? Wade’s biggest issue was his abandonment by his mother at an early age. Through the course of the story we learn that this tragic turn of events was quite possibly the thing that made him so bad. This wonderfully simple, yet powerful backstory, explains why Wade is so intrigued with Dan’s sense of conscience—he never knew a parent quite like him. It is also why he plays with Dan throughout the film, checking to see the breaking points, and how he might possibly turn the crippled rancher to become more like himself. So if instead of pleading to Wade’s sense of conscience, Dan decided to take the shortcut to success, Wade would have a reason to change and help Dan finish the journey. Why? Wade obviously has a problem with the way he personally turned out, why would he then want the same thing to happen to William were the boy to find out how his father basically “abandoned” him morally by selling out? Wade would see Dan’s compromise as a repeat of what his mother did to him and thus, would have a reason for taking the helpless father the rest of the way. This shift in their relationship would naturally lead to Wade’s change of character. A LOCAL GUNMAN who drops. Lungs clutching for air, Dan glances out the door behind them, shots still reporting from the street. He turns and faces Wade. That’s it, Wade. This is where we part. I’m taking you up on your offer. The reward. All one thousand of it. I want it. Dan pulls the REVOLVER from his belt and hands it to Wade. Just make it look real. And not the leg. I’d like to have at least one good one. SHOUTS outside as their pursuers move in close. I can’t shoot you Dan. Another GUNMAN bursts into the room. Wade BLASTS him with the speed of a jack rabbit. Dan reaches for the gun, Wade pulls away. That what happened to your leg? I never said I was a hero. Never even seen battle. They outnumbered us five to one that day, Wade. So you shot yourself to keep from the line. Tried to tell my boy I lost it retreating from friendly fire. He saw right through me. And he’ll see through you again. Trust me. I guess I’ll deal with that when the time comes. Out the cracked stock room door, WADE SPIES A ROOF WORKER’S LADDER. Wade dashes across CITY ROOFTOPS dodging WILD GUNFIRE from below. Dan follows close behind. Both stop before jumping over a narrow alleyway. You sure you can make this? Without thinking twice, Dan leaps across, pulling Wade with him. The impact sends a spasm of pain through his bad leg. I like this side of you Dan. They jump a second alleyway. Dan is in agony. And so on, until they finally reach the ticket booth. With these new pages, Dan’s embrace of temptation resolves the major source of conflict between the two gunmen. With this increased understanding of one another, their friendship flourishes and they now have a viable meaningful reason for making those last precious steps towards the awaiting train. The Authors wanted this friendly repartee, almost buddy-film like conversation, as the two weaved there way form bridal suite to train station; why not give it a viable believable reason for existing? In addition, there was a slight change to Dan’s backstory: his infirmary came as a result of a self-inflicted gunshot wound instead of the ambiguous “lost my foot during a retreat” reason given in the original screenplay. While effectively connecting Dan’s personal story with that of the relationship between he and Wade, it also speaks volumes as to why Dan becomes so heated in regards to people helping or not helping him. Having committed the ultimate act of cowardice in the Civil War, he would think himself less than worthy of any outside assistance. Again, every part of a story—even the backstory—contributes to the overall message of the piece. …Wade takes a KERCHIEF out of his pocket and begins to make a TOURNIQUET around Dan’s leg. Dan pushes him away, refusing the assistance. Finishes it himself. Yeah well, what else you call it. It’s my son… Mark… The younger one. Got tuberculosis when he was two… Doctors said he’d die if he… He didn’t have a dry climate. What’re you telling me this for. Guess I wanted you to know I’m not stubborn is all… Ben. Wade stares at Dan’s grin, and starts to smile himself. Friendship sealed, personal motivating issues back on track. The only change from the original material was Dan’s refusal of Ben’s help. The one thing driving Dan throughout the story was that no one ever raised a hand to help him—not even God. To accept fully Wade’s offer would only weaken his resolve, breaking the story’s message in the process. Wade and William were the ones who were ultimately supposed to change. Dan…well, Dan was supposed to be stubborn. As mentioned in the article What Character Arc Really Means, a Main Character does not have to transformationally change in order to grow. Dan Evans was one of these characters. Some may argue, but doesn’t the suggestion of having Dan take the money classify him more as the traditional Change Main Character? Dan’s personal issues weren’t so much about doing the right thing as much as they were about doing what was needed because no one would help him. Sure, the issue of conscience was important in the context of his relationship with his son and with Wade, but personally, his steadfastness comes as a result of the problems he endures because no one will help him. Maintaining that drive signifies his staunch resolve. Besides, Steadfast Main Characters are allowed to buckle; they’re not supposed to be this one note that rings solidly from opening curtain to final credit. As long as in the end they continue to do things the way they always have, they can be accurately referred to as Steadfast. In fact, one could argue that wavering steadfast characters are more true-to-life, even more honest than their simple straight-minded cousins. False moments occur when an Author does not fully understand the real problems and issues facing their characters. They happen when the feeling is that something is supposed to happen here, but what exactly that something unfortunately is remains elusive or unclear. Stories in relative state of development everywhere suffer from this disease, a disease that can easily be avoided with the proper understanding of meaningful story structure. 3:10 to Yuma presents the classic American Pursuit story, that is, the old standby of an Obtaining Story with an Overall Story Problem of Pursuit. Because Dan is a Steadfast Universe Character (lost his leg in the war), he finds himself driven by Help and scorned with Issues of Preconception (what his wife and boy think of him). While the storyform signifies his Problem as Help, in Steadfast characters this problem is seen more as a drive than a problem. It also happens to be the reason why he needs to continue being driven by it at the end of the story. William and Wade, both Changed Impact Characters, end up plagued by Pursuit as well, exemplified by their need to always jump into things head first, particularly on the part of William. Their Solution of Avoid is nicely shown with both Wade preventing his gang from freeing him and William dropping the gun on Wade and pulling away from him. Does this mean that these professional screenwriters used Dramatica to help craft this story? Who knows…if nothing else, it speaks highly of the program’s ability to holistically map out good story sense. Ignoring Wade’s false moment of character, the story otherwise flows quite nicely, with an ending that is both satisfying and emotionally fulfilling—the hallmarks of any great story. Whether or not it had any place in the production process at all, though, Dramatica does accurately point out the reason why that moment seems so false and provides an easy way to fix it. The Relationship Story Throughline, that is the relationship between Dan and Wade/William, suffers from a Problem of Conscience and therefore can only be resolved with a Solution of Temptation. This solution is not present at all in the final version of the film and, as explained in the article above, is the one thing that could have made their eventual friendship make sense. Continuing to employ the Problem of Conscience did nothing to shift the balance of conflict in their relationship and explains clearly why this was a false moment of character.